NETWORK UPDATE: There was no news for SECOND CHANCE in final numbers. 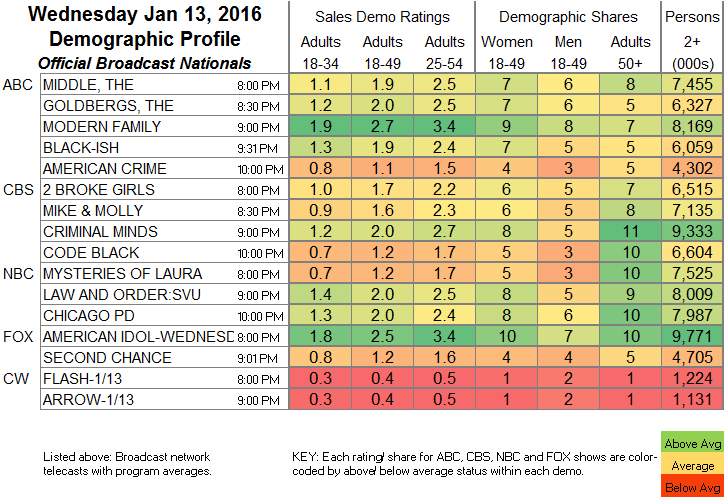 However, MODERN FAMILY gained 0.1, and CODE BLACK lost the same. CABLE HIGHLIGHTS: The season finale of FX’s AMERICAN HORROR STORY: HOTEL took the night at 1.15–but while that was up 0.30 from last week, it was down an ugly four-tenths from the 2015 finale. The return of A&E’s DUCK DYNASTY scored 0.72/0.67. VH1 also had a returnee, with 0.67/0.63 for MOB WIVES. History’s PAWN STARS was up 0.06 to 0.60, and AMERICAN PICKERS gained 0.06 to 0.57. ESPN’s NBA doubleheader was at 0.57/0.50, compared to last week’s 0.60/0.51. 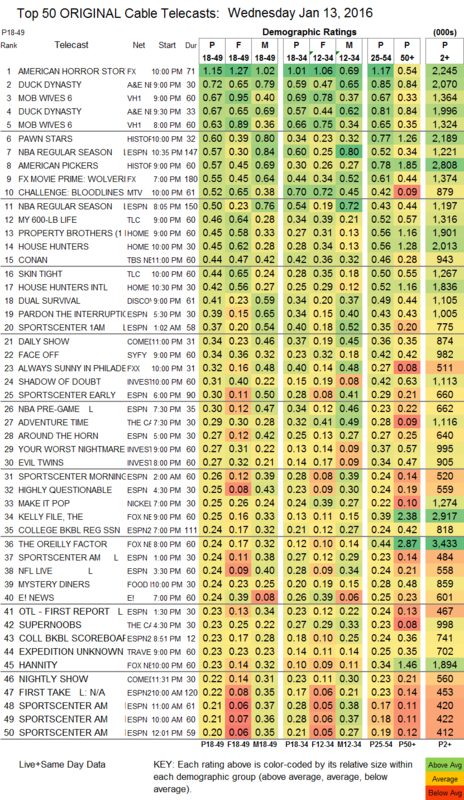 MTV’s THE CHALLENGE grew by 0.08 to 0.52. On TLC, MY 600-LB LIFE shed a couple of hundredths to 0.46, and SKIN TIGHT ticked up to 0.44. On HGTV, PROPERTY BROTHERS grew up 0.04 to 0.45, HOUSE HUNTERS dipped by 0.02 to 0.45, and HOUSE HUNTERS INTL gained 0.04 to 0.42. Discovery’s DUAL SURVIVAL was at 0.41. On Syfy, FACE OFF returned at 0.34. On FXX, IT’S ALWAYS SUNNY IN PHILADELPHIA dropped 0.13 to 0.32, and MAN SEEKING WOMAN slid by 0.02 to 0.15. TV Land and Nick At Night jointly premiered TEACHERS, which performed far better on Nick At Nite at 0.19, certainly not a big number, but not a terrible one considering that it launched at 11PM, has been available online for some time, and outrated the Nick At Nite portion of the YOUNGER 2-episode premiere, which was at 0.18/0.16. (On TV Land, TEACHERS only managed 0.09, and YOUNGER scored 0.17/0.13.) On Bravo, NEWLYWEDS: THE FIRST YEAR fell 0.07 to 0.15. Tru’s BILLY ON THE STREET lost 0.07 to 0.08.